In 2014 the Blake Archive added a new wing devoted to searchable HTML and PDF editions of back issues of Blake/An Illustrated Quarterly. Today’s publication—all 40 issues from the 1970s—is the final big installment of the Archive’s ongoing project of making freely available, and fully searchable, over four decades of the journal, thus making public some of the most important scholarly work done in Blake studies over the past half century. 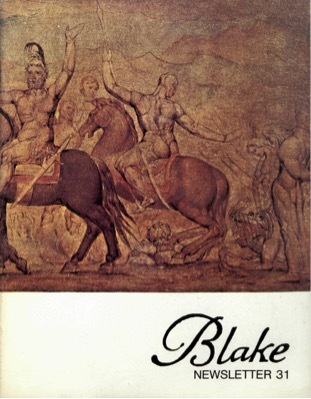 Over the course of the 1970s the journal published Robert N. Essick’s 160-page “Finding List of Reproductions of Blake’s Art” (summer-fall 1971), which provided unprecedented access to Blake’s visual art. The cover of the winter 1974-75 issue featured the first color illustration—with, inside, an ambitious double foldout of The Characters of Spenser’s Faerie Queene—to anchor John E. Grant and Robert Brown’s extensive essay on the painting, with an elaborate key to the characters in the painting and many enlarged details (8.3, winter 1974-75). “Newsletter” became “illustrated quarterly” in 1977, and the price of a subscription went up to $10 (for individuals) the next year. Thomas Minnick (Ohio State University) became the journal’s bibliographer, helping to turn the quarterly’s annual checklists of Blake scholarship into a regular feature. The 2017-18 volume year of Blake/An Illustrated Quarterly is its fifty-first, available only to subscribers. Future updates to the Blake Archive’s back issues will occur volume by volume as those fall outside the five-year window reserved for subscribers.